Hey! It’s been wonderfully busy over here- my days are full of quilting, knitting & cooking- I can honestly say I can’t remember being this peaceful. And instead of letting is sit on the shelf to be quilted in, oh, let’s say, about 5 years from now, I popped that sucker on the quilting machine right then! Used some of the music note fabric for the backing. 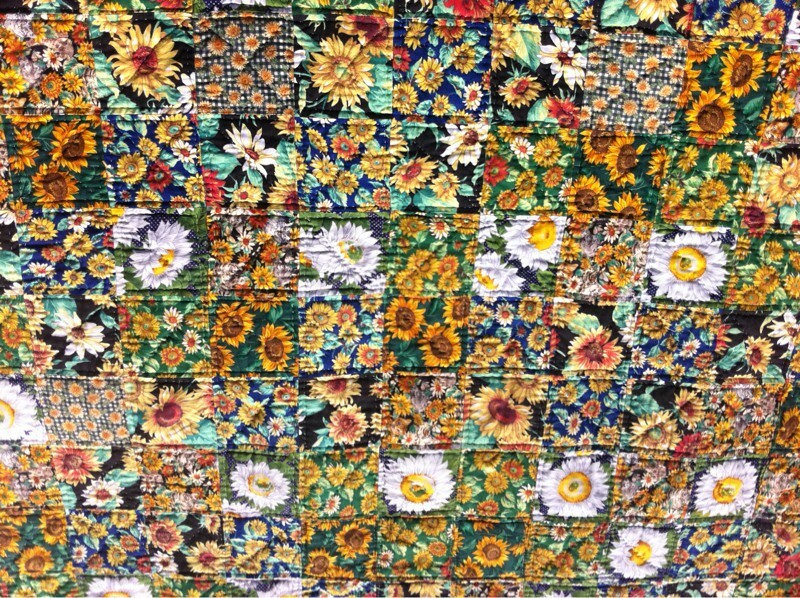 (This is fabric from my mom’s stash. It’s been used on who knows how many projects, but I can tell you it’s magical- because EVERY SINGLE TIME I dig that fabric out of the bins, there’s always more. ALWAYS!) I used a favorite quilting pattern from Munnich Quilt Recipes, dug out some matching fabric for a binding & voila! A very nice little runner. Granted it’s for Christmas & this is April, but hey- it’s done, I used stash, & I didn’t spend one added dime on this! 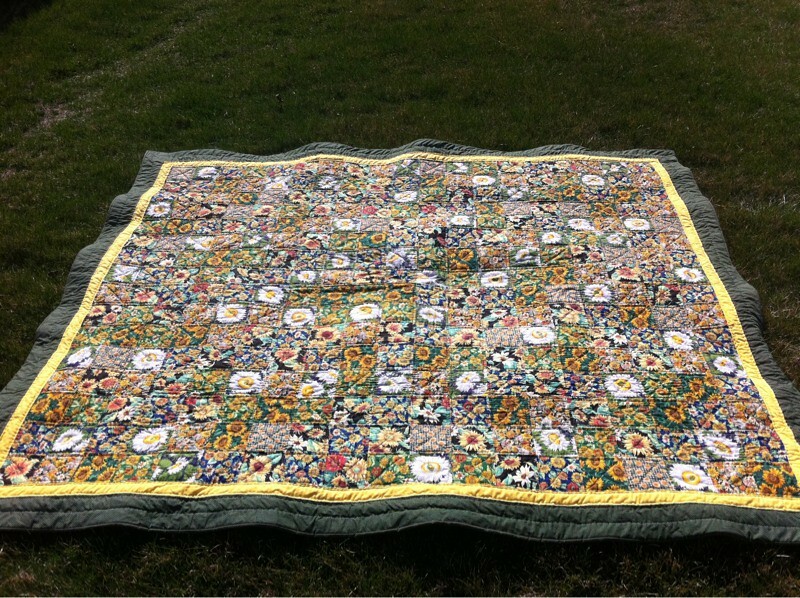 Back when I was in high school, my sophomore year, my sister made me a quilt top of sunflowers, daisies and cats for my Christmas present. That break she, our mom & I basted it together on the floor of our parents room. I started hand quilting it immediately. Then school, band & church all caught up with me & the quilt just sat there. So I sent it back to Colorado for my sister to work on. Then she moved back to Texas. 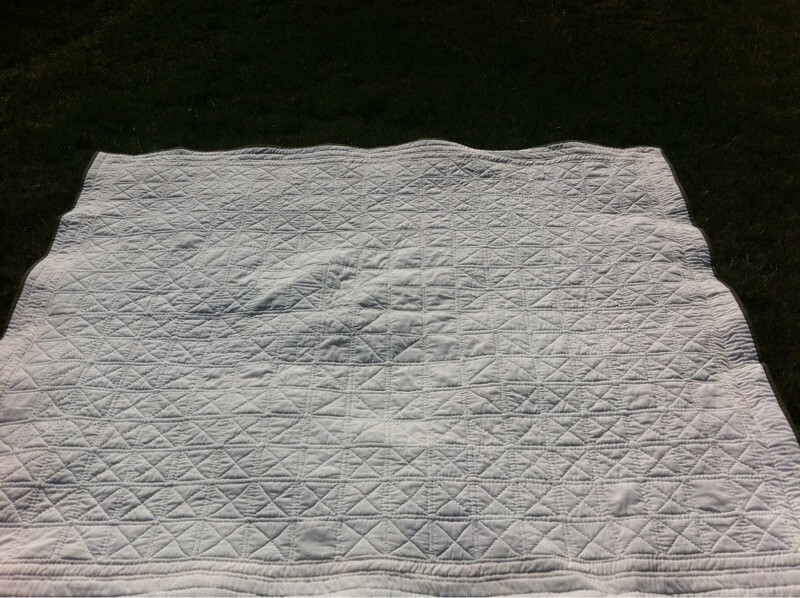 Then she had kids & gave me back the quilt. (now keep in mind this isn’t just a quilt we’re sending back & forth, there’s also this huge PVC pipe frame that’s going about half the country). Then time passes & I got my first apartment, and my 2nd and my 3rd. Still working on the quilt. Then I graduated from college & realized I’d been working on this project for over 5 years! Then a few more moves occur & before I know it, I’m in Alaska, married, it’s been 10 years & I’m still working on this quilt. Then more moves occur & every time I pull it out, I’d hear a groan from J. Yes, once again I was pulling out THE quilt that somehow took up the entire room & would end up as a cat bed. Then this year I realized I was turning 30 & this darn quilt would have been in progress for 15 years!!! Some women have beauty or youth crises when they turn 30- I however freak out about quilting. So I was determined to finish it this year! I pulled it out for the umpteenth time & noticed there really wasn’t much more to do- so I set to work. Then as it happened I went down to Texas & thought I would finish it then (here’s a lesson I should have learned by now- when you go visit your family, you’re not going to have things like TIME to work on quilts!) but after taking a nice little rest in Kansas on my way home, I see that the end is in sight for this quilt. Ahhhh, is there anything nicer than a finished quilt? ?